The Environmental Science Institute is pleased to offer the Billy Carr Distinguished Teaching Fellowship to celebrate the work of Billy Carr, retired Manager of Surface Interests for all 2.1 million acres of University lands. The fellowship encourages and supports efforts by young people to continually improve West Texas lands and to make West Texas lands as productive as possible through research and education. It celebrates the work of Billy Carr, retired Manager of Surface Interests for all 2.1 million acres of University lands. Each year ESI will review faculty applicants eligible to receive this endowed fellowship and select a recipient. The appointee will be a faculty member whose research and teaching support the fellowship’s goal of improving West Texas lands and to make West Texas lands as productive as possible through research and education.West Texas is broadly defined in this sense. Appointees may be from any department at The University of Texas at Austin. Potential uses of fellowship funds include student field trips, field or laboratory research, and support for presenting results of relevant research. The annual award varies annual between $5,000-$8,000. Interested applicants should email esi@esi.utexas.edu. 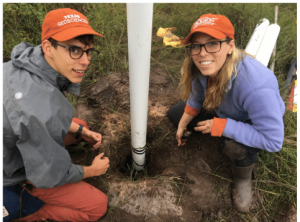 Billy Carr Distinguished Teaching Fellowship recipient Daniella Rempe (right) and graduate student Logan Schmidt (left) install boreholes for subsurface hydrologic monitoring at the Mt. Folkes study site. Photo credit: Chris Linick. 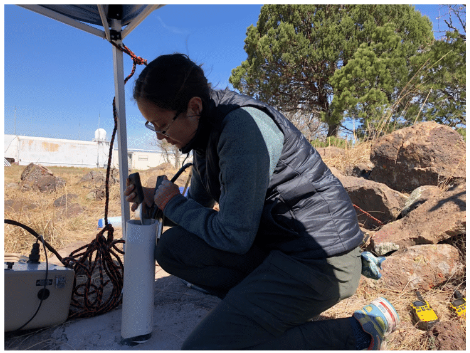 Quantifying the role of weathered bedrock on mediating groundwater recharge in the Davis Mountains, West Texas. 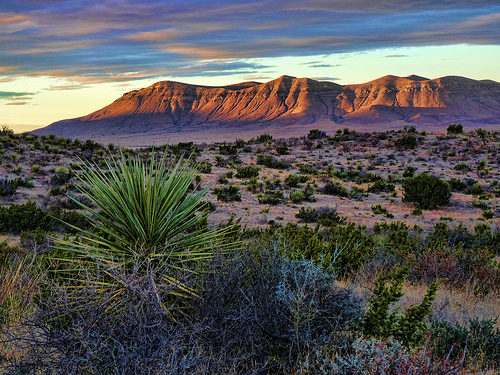 Much of West Texas is mantled with thin soils and underlain by many meters of weathered and fractured bedrock. This fractured and weathered bedrock plays a role in how precipitation is partitioned into various components of the hydrologic cycle (e.g. transpiration, evaporation, runoff, and groundwater recharge). Previous researchers have suggested that bedrock fracturing is the primary control on the magnitude and spatial pattern of groundwater recharge. In this study, we use a combination of hydrologic monitoring, geophysical surveying, and geodetic measurements to advance novel techniques for quantifying water storage dynamics in the complex weathered bedrock environment that lies between soils and the groundwater table. 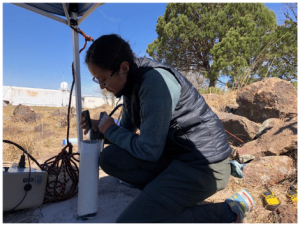 Thanks to the Billy Carr Fellowship award, the Rempe laboratory was able to establish a hydrological monitoring program at the University of Texas McDonald Observatory in Fort Davis, Texas to evaluate the extent to which the weathered bedrock in the Davis Mountains of West Texas facilitates the partitioning of incoming rainfall between evapotranspiration and groundwater recharge. The fellowship funds have been used to support undergraduate and graduate student travel to the MDO field site, where samples and geophysical data were collected for analysis by undergraduate and graduate students in the Rempe lab at UT Austin. Preliminary data collected by undergraduate and graduate students suggest the fine pores of the bedrock itself store a significant amount of water, with little storage occurring in large fractures. Samples collected during drilling have been prepared by undergraduate students, and are currently being analyzed in the Rempe lab for comparison with field-scale geophysical data. The novelty and impact of the project lies in the synthesis of datasets across scales for quantifying the water storage dynamics of weathered bedrock. Our ongoing invasive species research program is directed toward understanding invasion processes and providing novel biological control solutions for invasive species, with an emphasis on Central, South and West Texas. A major problem species of this region is buffelgrass (Cenchrus ciliare) which is planted as a pasture grass, but rapidly escapes into the brush where it outcompetes native vegetation, alters the arthropod communities, degrades the wildlife potential and alters the fire regime. Our research seeks to understand how the native grass community responds to buffelgrass under different management practices, and find fungal and insect detritivores associated with differences in decomposition rates between sites. Achieving a better understanding of this major invasive species in Texas ranchlands closely matches the fellowship goal by yielding potential improvements in the productivity and sustainability of this region. For over two centuries, the US cotton industry has played a role of catalyst for scientific and technological innovation. Nowhere is that more apparent than in the plains of West Texas. 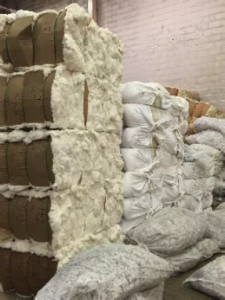 Texas plains cotton has gained prominence through continuous improvements in productivity and quality. 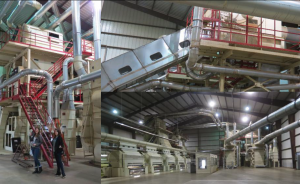 The most spectacular improvements were achieved in the West Texas areas served by the Lubbock and Lamesa cotton classing offices contributing a growing portion of the U.S. crop. 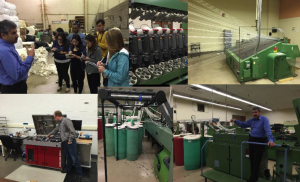 The Fellowship provided a unique opportunity for students from the division of Textiles and Apparel to gain awareness of the challenges facing the cotton industry in West Texas, and of the pioneering innovations developed to address them. Support from the Fellowship was instrumental in complementing our learning and research interactions with direct exposure to the industry through a field trip to the High Plains. A group of 14 students and two faculty members traveled to Lubbock and Slaton, TX in May 2015. 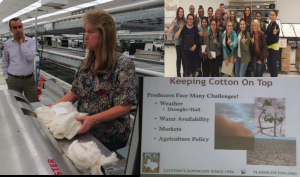 The group visited a cotton farm, the Lubbock Cotton Growers Co-op gin, the USDA-AMS cotton classing office, Plains Cotton Growers, Inc., and the Fiber and Biopolymer Research Institute at Texas Tech University. The farm visit was particularly eye-opening for the students. The group had the privilege of visiting Buzz Vardeman’s farm. Mr. Vardeman is no ordinary farmer, he is a pioneering inventor whose inventions have revolutionized farming in West Texas and beyond. 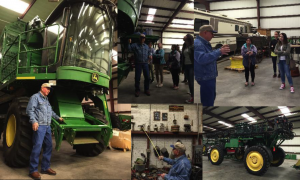 For instance, many of the innovations that make John Deere’s cotton farming equipment such technological jewels were born in Vardeman’s own shop. It was a privilege to tour the farm and the shop guided by Buzz himself and to listen to him explain to the students how an idea that flourishes in a determined mind can change the world. Buzz’ ideas have been flourishing for decades and have indeed changed the world far beyond his farm in West Texas. Figure 1. Texas plains cotton. Figure 3. Lubbock Cotton Growers Co-op Gin. Figure 4. USDA-AMS Lubbock Classing Office + Plains Cotton Growers, Inc. (PCG). Figure 5. Texas Tech Fiber & Biopolymer Research Institute. 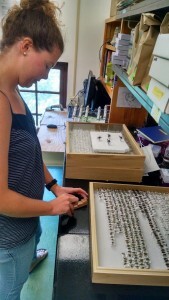 This study had two main objectives: 1) identification and curation of 30,000 native pollinators collected from more than 40 study sites across Texas, plus a pollen reference library with more than 70 native plant species, and 2) to develop outreach materials that illustrate native pollinator diversity, ecology, and conservation strategies. This will allow us to examine the pollen preferences of pollinator species across distinct regions and land use types (e.g., natural areas and cities). For the second objective, we created a habitat and foraging database for all pollinators in our collection so we could demonstrate to the public the importance of conserving a variety of nesting and foraging habitat for effective native pollinator conservation. 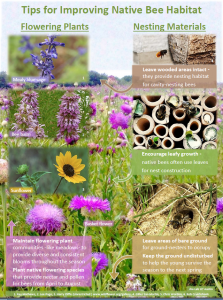 Specifically, we illustrated the importance of conserving nesting and foraging habitat in a series of pollinator outreach documents. These outreach materials are in both English and Spanish and include a photographic species list per site, including life-history traits, and a description of the habitat required by common species. Given that pollinator loss can dramatically reduce native plant reproduction, we hope to use our research insights to identify critical pollinators for Texas native plants and share information on how to best conserve habitat for diverse and abundant native pollinator communities. Figure 1. Undergraduate researcher curating a box of native bees. Figure 2. 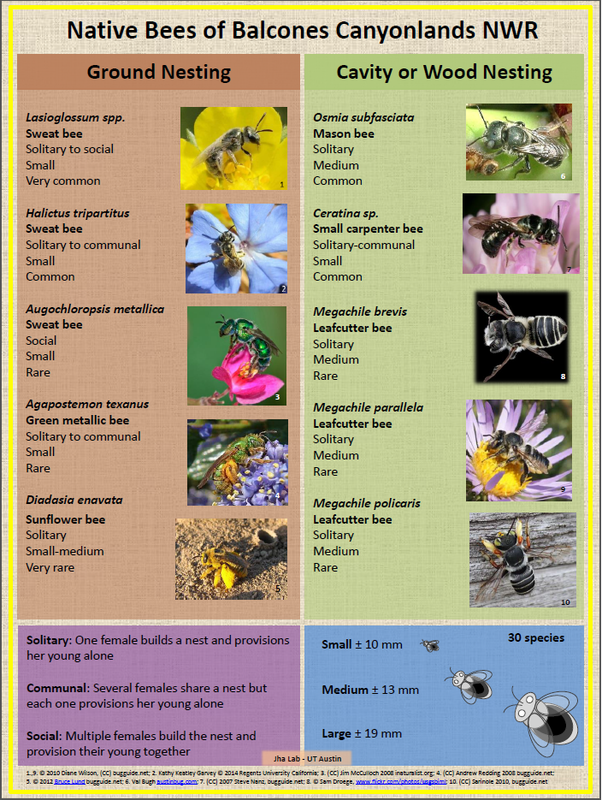 Photographic list of native bee species for Balcones Canyonlands National Wildlife Refuge. Figure 3. 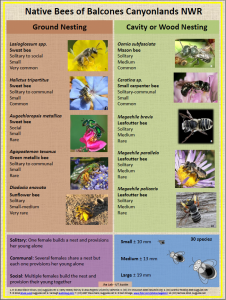 Material describing native bee habitat. Figure 4. 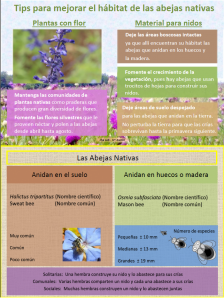 Accompanying native bee species and habitat information in Spanish.